Terra Promessa turned some heads on 2/5, winning a 1 1/16m AOC at Oaklawn by about 9 lengths in her 3rd start. I'd expect her to step up into stakes company next time out. Exaggerator finished 2nd, beaten 1 1/2 lengths (by Nyquist) in the San Vincente at Santa Anita. Off the Tracks won the 6 1/2f Margate Handicap at Gulfstream on 2/21 after being bumped at the start.. She is a half sister to Concord Point. Union Jackson won a 6f allowance race at Oaklawn on 2/26. Good job, Chili! I hope they go with a Stakes race next time out. Keen Ice is set to run today in Round 3 of the Al Maktoum Challenge as a world cup prep. Good luck and come home safely! Keen Ice finished 7th in Round 3 of the Al Maktoum Challenge. While Sheikh Mansoor bin Mohammed al Maktoum's Special Fighter thrived on the front end under Fernando Jara in Round 3, Keen Ice faded turning for home after stalking from fourth in the far turn. The Travers winner ended up seventh in the prep for the $10 million Dubai World Cup (UAE-I) March 26 at Meydan. Rebel Spy (half brother to Secret Status) finished 2nd, beaten 4 1/4 lengths, in a 1m70y Claiming race at Penn National on 3/9. Calypso wrote: Terra Promessa turned some heads on 2/5, winning a 1 1/16m AOC at Oaklawn by about 9 lengths in her 3rd start. I'd expect her to step up into stakes company next time out. Terra Promessa did just that, she won the Gr.3 Honeybee yesterday at Oaklawn. By over 6 lengths. Exaggerator finished 3rd in the San Felipe at Santa Anita, behind Danzing Candy and Mor Spirit. Theogony finished 4th in the Azeri S. beaten 1 length behind Call Pat, Untappable, and Streamline. Congrats to Curalina and her connections! Stageplay is entered in the Gr.2 Fairgrounds Oaks on 3/26. 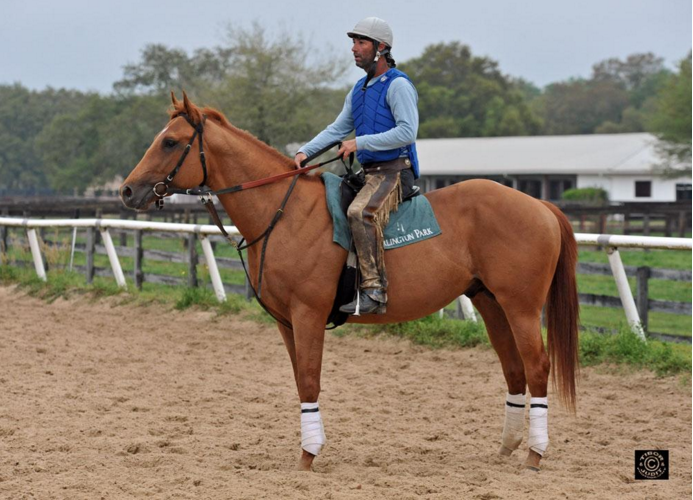 Ride on Curlin is entered in the Gr.2 New Orleans Handicap, also on 3/26. Good luck and safe returns to both! Calypso wrote: Stageplay is entered in the Gr.2 Fairgrounds Oaks on 3/26. Stageplay finished 6th, beaten 13 1/2 lengths. Ride on Curlin finished 10th (last), beaten 18 lengths. Keen Ice finished 8th in the Dubai World Cup. Keen Ice has been transferred from Dale Romans to Todd Pletcher's barn. Honestly, I am not a huge Pletcher fan but I like the move. Hopefully he does well. Off The Tracks (half to Concord Point) finished 3rd by 2 3/4 lengths (nearly 6 lengths in front of the next horse) in the Gulfstream Park Oaks. It was the first loss of her career. Carouse finished 3rd by 3 1/4 lengths in the Wildcat Handicap at Turf Paradise. Terra Promessa won the Gr.2 Fantasy by a neck for her second graded stakes score. On to the Oaks! Exaggerator won the Gr.1 Santa Anita Derby by daylight (6 1/4 lengths). Theogony is entered in the Apple Blossom on 4/15. Three runners at Keeneland on 4/15. Union Jackson is entered in Race 2 (6f AOC). Upstage is entered in Race 6 (1 1/16m MSW). Top Billing is entered in Race 8 (1m AOC). Copperplate finished 2nd. Not bad for his first race in about 5 months (he got a rest in KY over the winter). In the US, he's 15-2-1-0. Finished 8th of 11, beaten 22 1/4 lengths. Congrats on the placing, BL! I'm looking forward to watching him this summer. Is he as sweet as he looks?